Growing up, Parippu vada (Masala vada), as we call it in Kerala, used to be one of the most popular after school snacks. It is made of Channa dal (Bengal gram) or Kadala parippu as it is known in South India. It comes from black chickpeas (Kala chana) – they are split, then the outer skin is removed and polished to make the golden yellow dal. 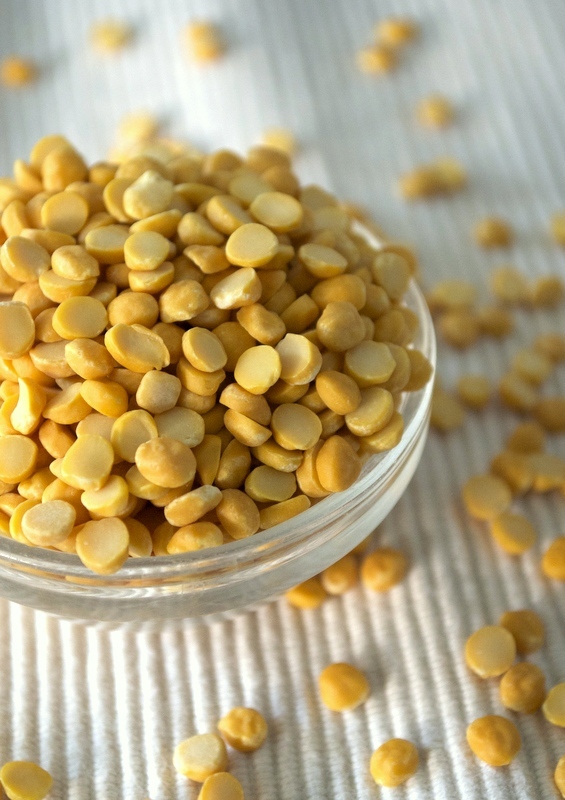 Channa dal has an exceptional nutritional profile – high in protein and good carbohydrates. It is also packed with so many other healthful goodies that it can almost be a complete meal in itself. It used to be considered a poor man’s food but these days its making a come back as a nutritious power food! Channa dal is vey low in glycemic index, hence it is a great choice for people who want to watch their calorie intake or for people who are diabetic. 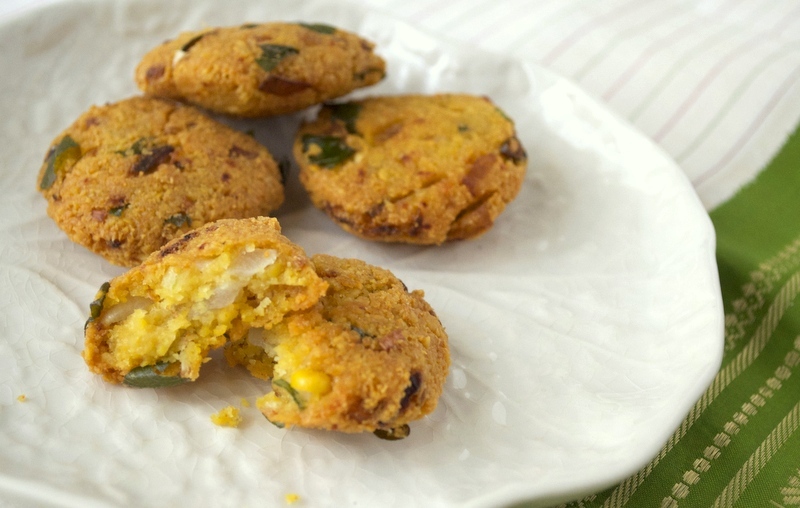 You can do anything with it – simply boil it, make a dal curry out of it or make snacks like these vadas. Because of its high dietary fiber content it takes longer digest in the intestines, hence the sugar is released into the system in a slow controlled manner, which reduces food cravings. To make these parippu vadas, channa dal is washed and soaked in cold water for a couple of hours before grinding it into a coarse paste. A splash of dry red chili flakes, red shallots, chopped ginger and fresh curry leaves are added just before frying it in coconut oil until it is golden in colour and crispy. Serve it with a cup of hot chai or South Indian coffee. It tastes wonderful when fresh, piping hot and crispy. Believe me, it is a snack which you will never regret having! Wash channa dal in plenty of cold water until the water runs clear and then soak it in 2-3 cups of cold water for two to three hours, then drain it in a colander. Remove the ground paste to a bowl and mix it with chilli flakes, chopped shallots, chopped ginger, fresh curry leaves and enough salt. Shape the mixture into small lime sized balls and flatten each ball in between your palms to make 5-6 cm round discs. Heat oil in a frying pan and deep-fry the flattened discs until crispy and golden brown in colour. Drain on kitchen paper and serve hot. Tags : Chana dal, Chana dal nutrition, Kadala parippu, Keralan snack, Parippu vada, South Indian snack recipe. Its been a long while since I been through this blog. But what better way to return than seeing one my favorite food’s recipe. I adore parippu vada, that too as an evening snack with tea….wow.. 😀 Feel like having one right now. We had a tea stall right below our college grounds where they serve fresh parippu vada, bhajis and chai. And they used to serve a condiment along with it; a slightly watery red chilli paste. A dip into the paste, and a bite in to the crispy freshness. Heaven! Need to find that combination again, somehow. 🙂 Thanks for a new recipe, Aunty. Thanks for leaving such a wonderful comment! Parippu vada is my favourite too. Dipping in a chilli paste sounds delicious.I never had it that way. Please let me know when you find that combination again. I would love to try!